The house was clean, and the coffee was on. All we had to do was tell our story. The reporter (John) and cameraman (David) showed up and we were playing bocce ball in the front yard. They were going to film us doing that, I am thankful that Griffin wanted to play on the swingset. Could you imagine seeing us on the news playing bocce ball?? Talk about looking like dorks! :) They filmed us playing. They made us feel comfortable. Griffin was great, his smile lit up as we gave him underdogs. John and David raved about our lot--it is truly beautiful and today it was especially beautiful with the sun glistening on the lake. 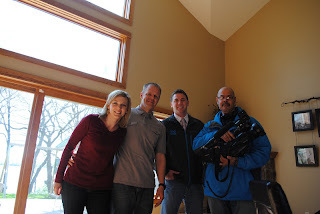 We went inside and were interviewed on our red couch, one of my favorite places in our home. We told our story. I was reminded of how tough the journey was, but what it did for us. We have grown closer, we're a team, even when we disagree. We've learned to grieve with each other, we shared the same pain, and we worked through it together. We appreciate our miracle. We want to grow our family, together, in a unique way. I got a little choked up when I talked about our babies that I never got to meet. But, I did OK. I felt strong. It felt right, sharing our story with a total stranger so that it could be on television. I prefer being under the radar, but this felt right. John was so genuine and caring. He felt bad asking the tough questions, but I was glad he asked them. The tough questions are the ones that help us tell our story. Griffin showed them his new room, the room he will move into when the baby arrives. He showed them photos of his cousins, his books, his bad. It was so cute to see him give a tour of his big boy, big brother bedroom. We looked at each other and I know we were thinking the same thing. We are so proud. I was interviewed while I was on Facebook. I showed them our site and talked about the support we've received. Typically after an interview or conversation, I mull it over and think, "I wish I said this" or "I shouldn't have said this." I'm not really doing that (much) this time. Maybe it's because only 60 seconds will be on TV and I can't control what is chosen to play. Or, maybe it's because I'm just thankful my living room was clean. Wouldn't you be? Jamie and I talked this afternoon, this interview was therapeutic for us. Sharing our story and hoping that it helps others. Someone is splicing and piecing together our interview right now. Crazy. I feel so uplifted, like maybe our difficult journey can help someone else. And, it makes it all seem worth it. I'm glad it felt good! I know it is a struggle, wondering, thinking too much what may or may not happen. It's all about interpretation--and how each human in our world will interpret the exact same thing differently. I hope we both did justice with our interviews!